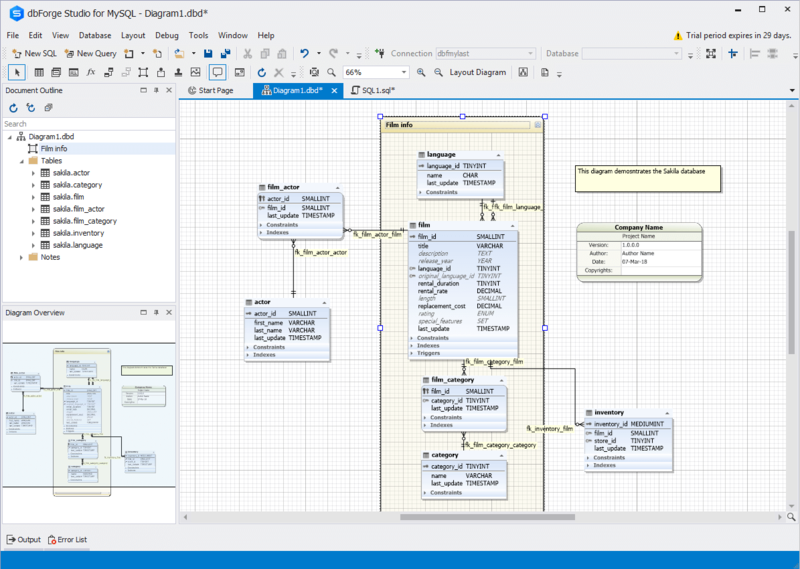 Are you looking for a visual database designer for MySQL and hoping that it will also be a free MySQL data modeling tool? 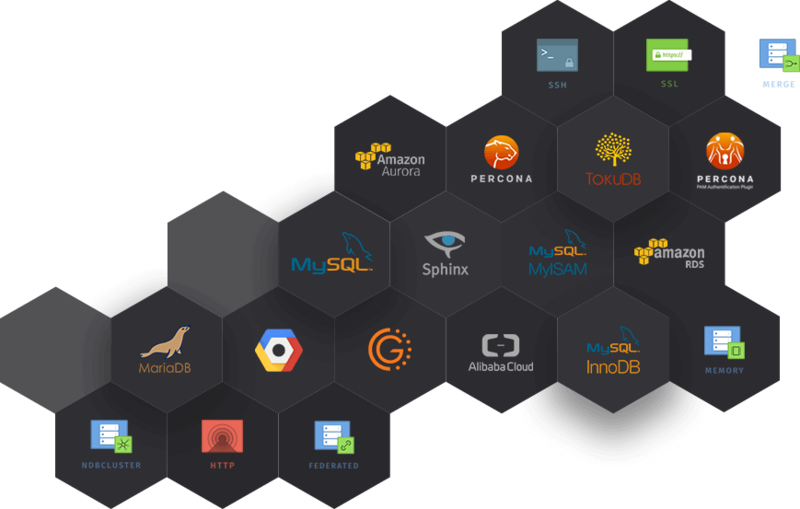 It's time to visualize your database structure and get the simplest way to create, analyze, reverse-engineer, print, customize, and do any database development tasks. All this is possible with a reliable MySQL database designer offered by dbForge Studio for MySQL. 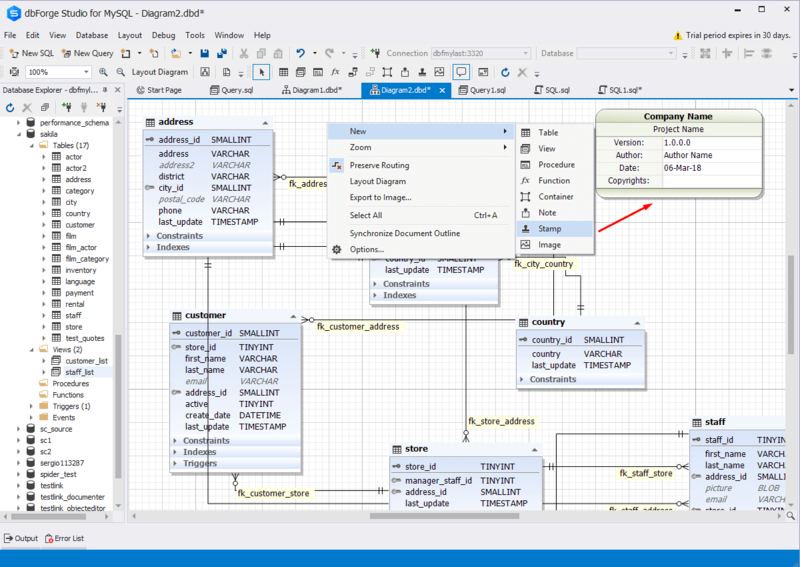 In addition, with a MySQL diagram tool you can create schema diagrams, add keys and relationships with several clicks. Available in a free Express edition! 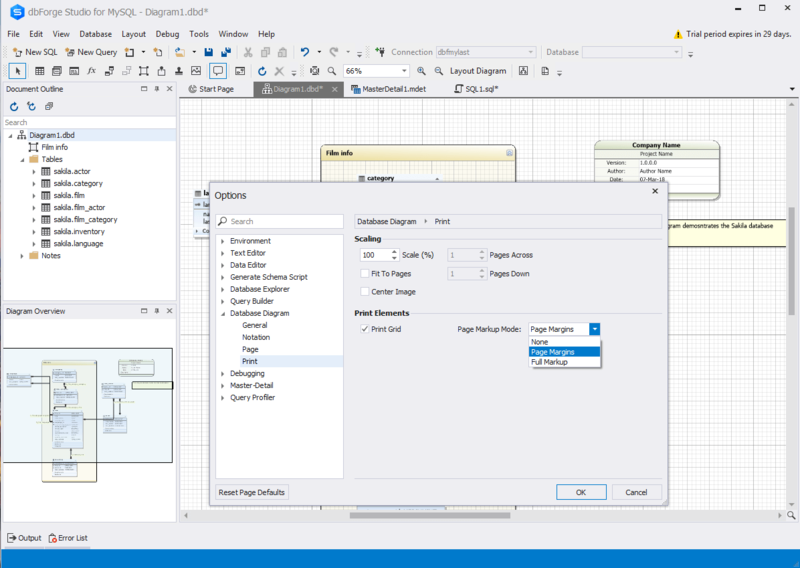 To create a visual database representation, just drag a necessary database or a database object from the Database Explorer tree onto the database designer for MySQL surface. All objects and existing connections will be neatly reflected on the MySQL database diagram to simplify the further analysis. 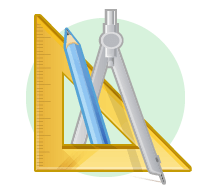 Any part of the diagram available on the database designer for MySQL surface can be displayed on a screen in any scale without using scroll bars, but only with a mouse scroll and a single key. Perform any action on the diagram using a keyboard. 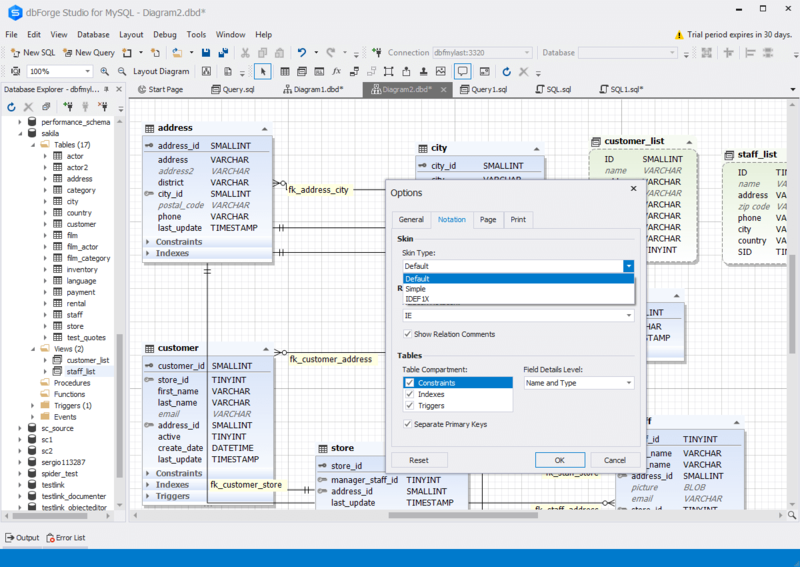 Try the MySQL database design tool and experience convenience, speed and design at its best. 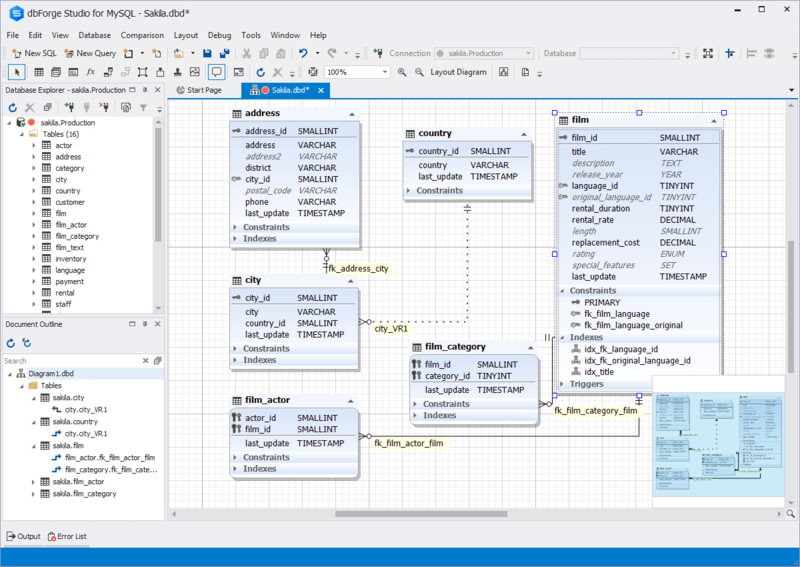 The MySQL database diagram in dbForge Studio is a database representation that is synchronized with a server in real time. This allows you to see the most recent updates, even the ones made by other users, and update the database schema instantly. Have a database schema too large to analyze on your screen? With our tool, that is not a problem anymore. Direct printing markup on the MySQL database diagram will allow you to efficiently layout the objects before printing. Overlapping between the sheets and special mark-up will help you glue fragments of your diagram. State-of-the-art and friendly UI of the database designer for MySQL conveniently represents the diagram. There are three skins for database objects (including IDEF1x), and two types of notations for connections between them (IDEF1x and Crow's Foot). Besides the database schema itself, you can place sketches of new objects onto the database designer for MySQL surface, link any external documents to it, add stamps including document description.